HICKORY, N.C.--(BUSINESS WIRE)--The drive toward the next generation of wireless technology is playing out in the infrastructure market with new features and capabilities being introduced in key radio access network equipment. CommScope, a leading supplier of network infrastructure solutions, is leading base station antenna innovation with the first antenna on the market to cover 1400-2700 MHz, the broadest frequency band range available. The antenna—available now—also supports 4x4 multiple input/multiple output (MIMO), a critical 5G-enabling technology for increasing network capacity, in all frequency bands. The CommScope ultra-wideband antenna RRZZ-65B can support one or two antenna arrays in 1427-2690 MHz, a high band range no other antenna can match. It can also support a low band range of 694-960 MHz. The RRZZ-65B supports 4T4R operation, meaning four beams of transmit and receive signals, in both the low and high band ranges, as well as frequency division duplex (FDD) and time division duplex (TDD). Operators can combine on one antenna the supplemental downlink band of 1400 MHz as well the primary band. It can also be used in conjunction with external filters to separate different licensed bands as needed, such as the 2300 TDD band, making it easier to customize for specific needs. 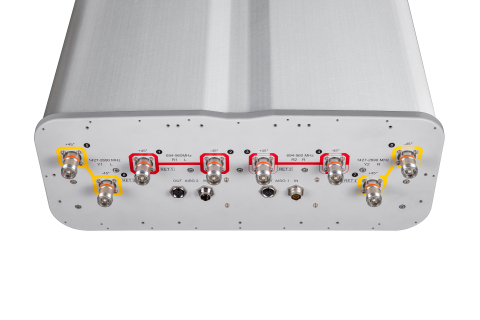 The RRZZ-65B is the first antenna available to the industry to support 4xMIMO for 1400 MHz. The market driver for the RRZZ-65B antenna is the 1400 MHz spectrum that has recently been auctioned in Europe. CommScope also expects to support 3.5 GHz, a likely 5G frequency band, with this antenna platform in the future. “CommScope ultra-wideband antennas help operators support multiple wireless networks via space-saving equipment, minimizing leasing costs while delivering flexibility for future network configurations,” said Firouzbakht. CommScope (NASDAQ: COMM) helps design, build and manage wired and wireless networks around the world. As a communications infrastructure leader, we shape the always-on networks of tomorrow. For more than 40 years, our global team of greater than 20,000 employees, innovators and technologists have empowered customers in all regions of the world to anticipate what’s next and push the boundaries of what’s possible. Discover more at http://www.commscope.com. CommScope is offering the first ultra-wideband base station antenna on the market to cover 1400-2700 MHz, the broadest frequency band range available.